In June 2006, Army Sergeant Adam Poppenhouse went on his first deployment as a tanker with the 3rd Stryker Brigade, 2nd Infantry Division to Iraq. On Dec. 3, 2006, he and his company were securing a crash site and rescuing a pilot when SGT Poppenhouse’s vehicle hit an improvised explosive device (IED) in Taji, Iraq. SGT Poppenhouse immediately lost his right leg in the blast. Following numerous surgeries over two years, Adam elected to have doctors amputate his left leg in order to move forward with a relatively pain-free life. After aggressive physical therapy and rehab, Adam was able to regain an active lifestyle using prosthetics. 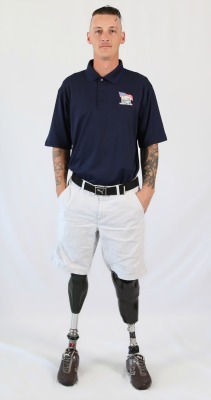 Now medically retired, Adam is an amateur golfer and is involved with the Salute Military Golf Association, an adaptive sporting outlet for returning injured Service Members. An avid racecar driver, Adam started his own nonprofit for adaptive motorsports called Leadfoot Warriors. His wife, Megan, is also a golfer and enjoys outdoor activities such as hiking and running. Together, they recently started their own real estate company called Poppenhouses LLC. They also facilitate activities with children at local homeless shelters. Adam says having the financial freedom of owning a mortgage-free home will allow him and Megan to expand their business along with their other ventures. Since the birth of Adam and Megan’s sons Adam Jr. in 2015 and Senna in 2018, Adam has faced new challenges at home. When in his wheelchair, he has trouble reaching the countertops, making it challenging to prepare bottles. Additionally, Adam has difficulties navigating around the home while holding his sons and maneuvering his wheelchair. Lowered countertops and an open floor plan in a specially adapted Homes For Our Troops home will mitigate these issues for Adam. Originally from Ohio, Adam is choosing to have his home built in the Las Vegas area where they currently live to be close to family. Adam is grateful to HFOT’s donors and supporters, who will contribute to the building of his specially adapted home. “Being accepted into Homes For Our Troops program is humbling but also incredibly exciting,” he says.